Ok, so this one isn't a MAME cabinet, but still. Jesus. It's a jukebox. Isn't that MF obvious? DUH! When I think jukebox, I'm definately thinking about a sloppily built, upright, black arcade cabinet with a buch of slot machine buttons on it. Don't forget to throw in a tiny monitor with a giant flat black marquee around it. No doubt. If you're going to make a MF jukebox, it should LOOK like a jukebox. 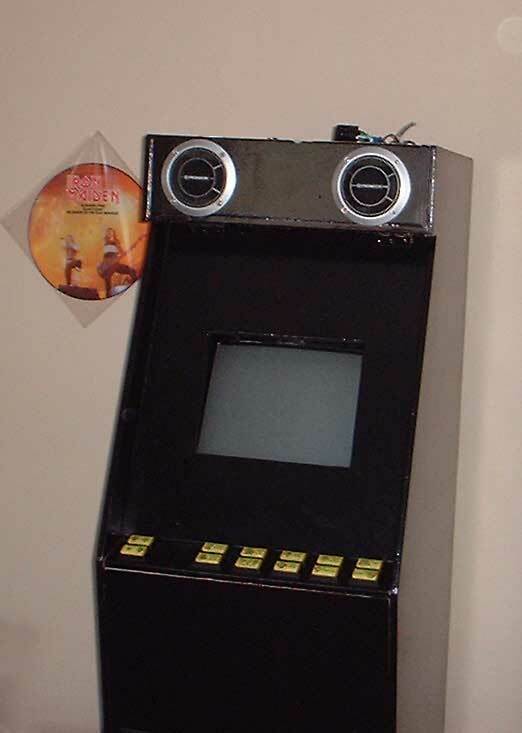 This doesn't even LOOK like an arcade game, it just looks like CRAP! But hey, the software is pretty decent. And there's that snazzy Iron Maiden disc on the wall. METAL UP UR AZZ D00D!